Where: The Learn ArcGIS booth will be located across from the Esri bookstore on the ground floor of the San Diego Convention Center. When: July 10–12 from 8:00 a.m. to 6:00 p.m., and July 13 from 8:00 a.m. to 2:00 p.m.
What: You will learn how to use ArcGIS to visualize, analyze, and share geographic information by completing lessons based on real-world situations. Learn ArcGIS will go on the road this summer. At the 2017 Esri User Conference (Esri UC) this July, you can stop by the Learn ArcGIS booth, sit at a computer, and browse through the online lessons and links to other resources such as The ArcGIS Book. If you have time, you can even take a lesson. A staff member from the Learn ArcGIS content team will be on hand to answer your questions too. 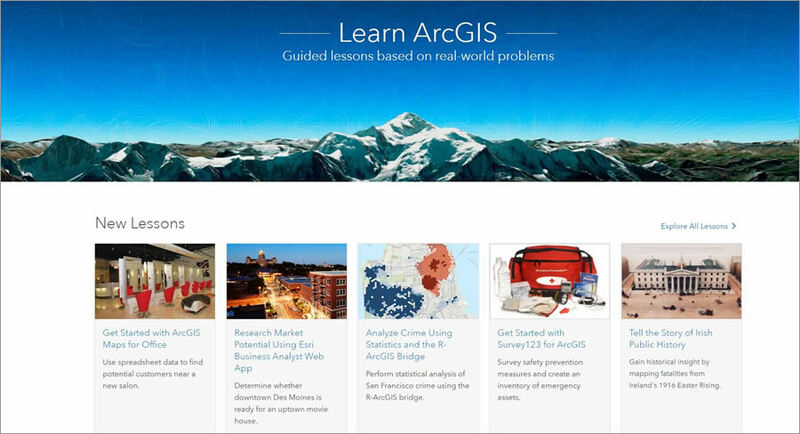 The Learn ArcGIS website currently hosts 48 lessons. 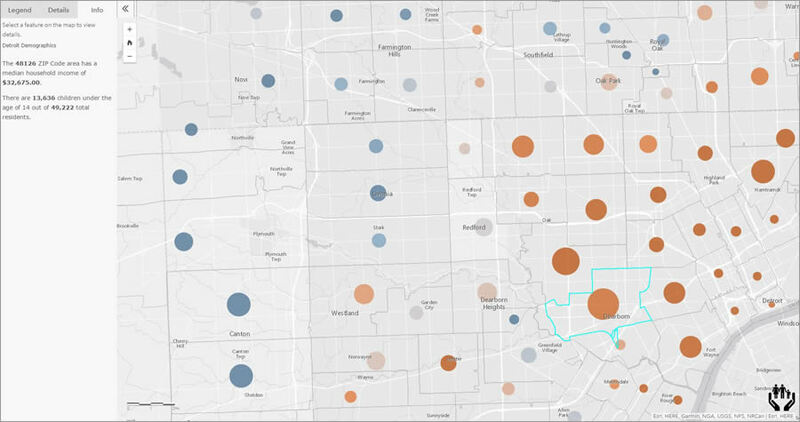 The 48 lessons currently available on the Learn ArcGIS website will teach you skills using ArcGIS, from analyzing and mapping crime statistics to mapping voter data for political campaigns. Lessons focus on a wide variety of topics, including producing actionable intelligence for military operations, monitoring emergencies, surveying customers' opinions, and analyzing demographic data to fight childhood poverty. More lessons are expected to be added to the website before Esri UC. Working on most of the lessons requires an ArcGIS account. However, you can sign up for a free 60-day Learn ArcGIS account or a free ArcGIS trial offer to complete the 30-minute to three-hour lessons. Learn ArcGIS, launched in 2014, features story-driven lessons. The lessons have been popular with ArcGIS users, who flock to the site monthly in large numbers. The approach to teaching software using real-life scenarios contrasted sharply with the many how-to websites that emphasize keystrokes and software. "When I looked at websites of other tech companies, I saw that they put a heavy focus on reference documentation," ArcGIS documentation manager Catherine Ortiz said. "We decided to take case studies a step further." And that approach has apparently worked; as of this spring, Learn ArcGIS averaged nearly 340,000 page views each month—a fivefold increase in less than three years. 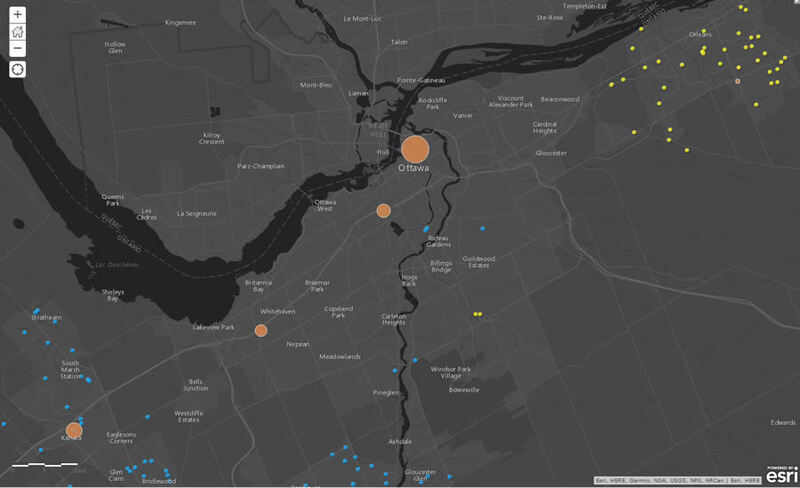 An ArcGIS Maps for Office lesson guides users through how to map the locations of high-end salons and data about the salons' potential customers. "This site is aimed at people who don't know where to start," Ortiz said. "It's not about the 'buttonology' of the software." Ortiz and Clint Brown, Esri director of product engineering, wanted the Learn ArcGIS lessons to take a story- and problem-driven approach. As reasons, they cited the rapid evolution of the GIS platform, the public's increased understanding of the science, as well as acceptance and expansion of cloud-based services. "Everybody's data was a URL away," Brown said. Learn ArcGIS was designed to be a site for self-study. The interactive site relies on cloud-hosted ArcGIS Online for mapping, data, and storage. Learn ArcGIS launched in 2014 with nine lessons that garnered more than 58,000 monthly page views. As the months ticked by and the popularity of the site grew, the team added authors who work both inside and outside Esri. Kathryn Keranen is a private sector consultant and GIS adjunct professor at James Madison University in Virginia. 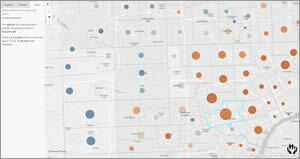 Since discovering Learn ArcGIS in 2015, Keranen has authored four lessons, including Track Crime Patterns to Aid Law Enforcement and Survey Customers to Gain Market Insight. "The Learn ArcGIS website has provided a welcome change of instructional material to the GIS user," Keranen said. "The site not only has a fresh look but a unique delivery of geospatial learning material." Many people from around the world use Learn ArcGIS, and Esri has worked hard to make it user-friendly to citizens of countries who are not native English speakers. Learn ArcGIS team authors avoid using distinctly American words and phrases so the site's content can be better translated into six foreign languages. This map was created for a lesson on how to identify areas in Detroit, Michigan where poverty relief programs could be offered. Vasily Rupan, a native Russian speaker and the localization project manager for the Learn ArcGIS team, said some of the site's initial lessons, including the lesson titles, confused foreign vendors and reviewers. He said the English needs to be "global ready" for translators as well as for nonnative English learners. Statistics from 2016 show that Spanish is the most-used foreign language for Learn ArcGIS, followed by German, Russian, French, Chinese, and Japanese. All lessons are initially posted in English. Rupan said translations are published about two weeks later. 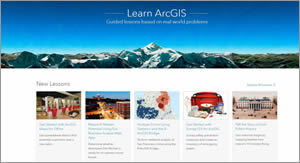 A redesign of the Learn ArcGIS website is under way and will be completed by Esri UC. The redesign includes a new look and more search options. The website, which currently uses a lessons-only approach, will expand to include videos, blogs, and story maps. "It will still be Learn ArcGIS but with extra stuff," said Learn ArcGIS team supervisor Riley Peake. "Altogether, it will be a richer experience for the user." Peake hopes many people will stop by the Learn ArcGIS booth in San Diego to visit with staff and explore the site. "Talking directly to users is the best marketing we have," Peake said. "The second-best marketing tool is word of mouth—if users like it, then they will tell their friends."